Аннотация к книге "The Manifesto on How to be Interesting"
Bree is a loser, a wannabe author who hides behind words. But when she's told she needs to start living a life worth writing about, The Manifesto on How to be Interesting is born. Six steps on how to be interesting. Six steps that will see her infiltrate the popular set, fall in love with someone forbidden and make the biggest mistake of her life. Bree is a loser, a wannabe author who hides behind words. But when she's told she needs to start living a life worth writing about, the Manifesto on How to Be Interesting is born. Six steps on how to be interesting. Six steps that will see her infiltrate the popular set, fall in love with someone forbidden and make the biggest mistake of her life. 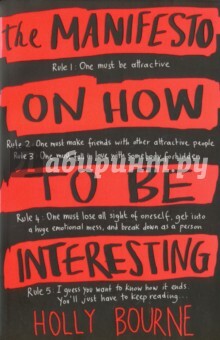 Книга The Manifesto on How to be Interesting - Holly Bourne.